My 4-wide version of Porsche’s Group B Beast, the 959. What happens if you give anabolic steroides to a Porsche 911? You get a 959! 4-wheel drive, 6-speed gearbox, the first engine with a sequential twin-turbo and an amazing “bodykit” combined with the classic design of the 911. The 959 was first built as a Group B Rally car and finished 1st and 2nd in the 1986 Paris-Dakar Rally. The street version was the world fastest production car when it hit the streets (Vmax = 195 mph / 317 kph). It was first beaten by the Ferrari F40. I wanted to build the 959 quite for a while, but I have to admit that Loek Marcus was faster. He was the first buider I know who made a 4-wide 959. 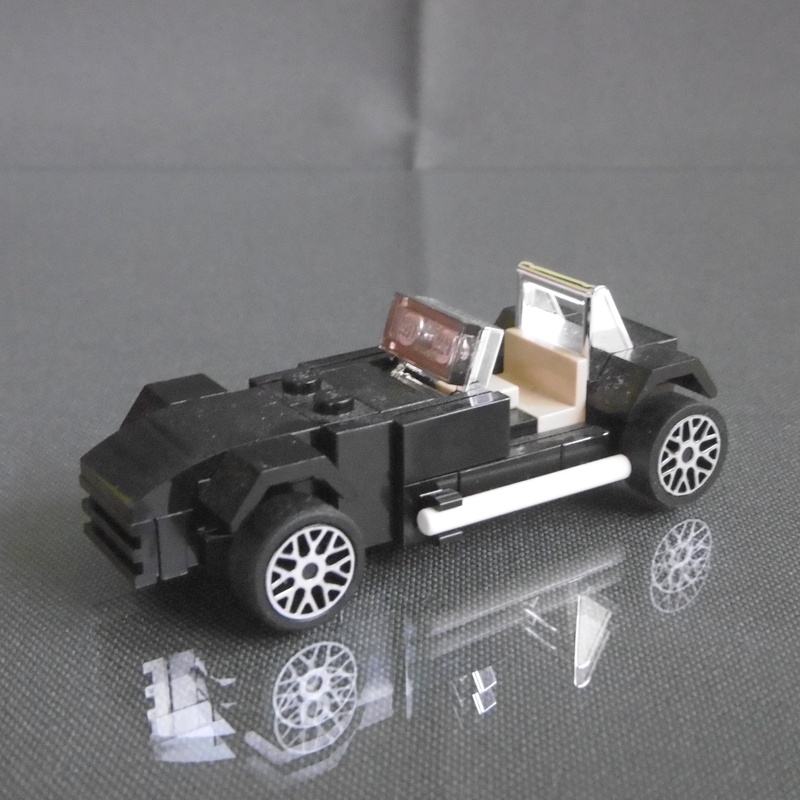 But it was Tom’s (DeTomaso Pantera’s) “fault” that I really started building this one. He wrote a comment for my latest 911 that mentioned the 959. 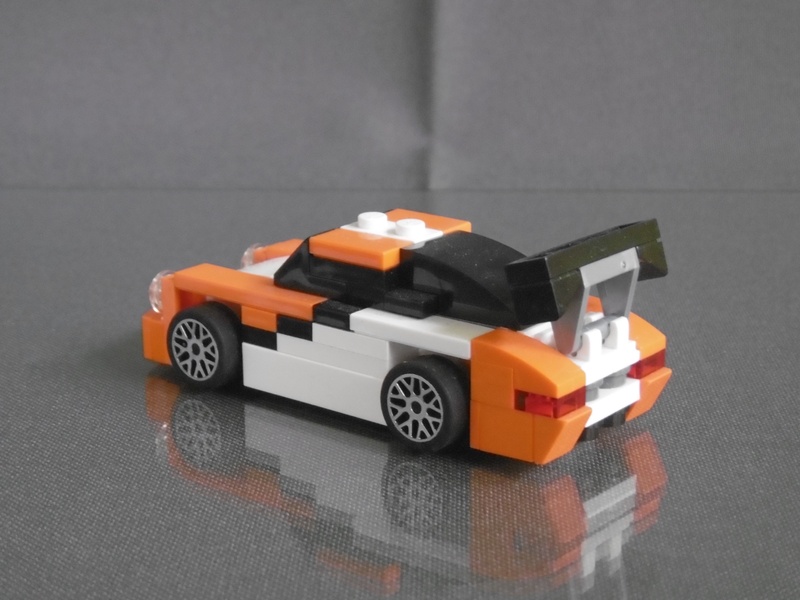 I started with the 911 and tried to combine it with some details from my Audi Sport quattro S1. It became quite difficult to combine the “3-wide” center section of the S1 with the side panels of the 911. There was always a “half plate offset” in the way. But I finally found a solution. 911, 914, 550 spyder and 959. So this is my 4-wide LEGO Porsche 959. As I had to wait for some parts to arrive, I had some time for a little redesign of my new 4-wide Batmobile after posting my preview. I’ve changed the shape of the roof section and the rear bat wings to get closer to the original. Rear right view: Afterburner on! Front view: That’s a big air intake for that turbine. And now the quiz question for the Tim Burton Batman movie fans: What’s the main difference between the 1989 and the 1992 Batmobile? … Tadaa! – The Batmissile! Front view: Better get away! … and a little turn to the right. New “bat wings” on the rear end of the Batmobile. And there is the Batmissile. After seeing Isaac’s and Hot Rod’s 4-wide VW busses with opening doors I was heavily inspired to add an interior to my Camper, too. I started building an interior with LDD some weeks ago, but I hadn’t found the time to order the missing parts until last week. I got the last missing parts last week and immediately started building the new version. A little change on the front: I moved the headlights 1/2 stud higher, but I had to let go the cheese wedges for that. I rearranged the side windows and added a mirror on the left side. The rear end didn’t change much, I only replaced the two 1×2/2×2 brackets by one of the newer 1×2/2×4 brackets. On the right side I added opening doors just like Isaac and Hot Rod did on their vans. I kept the roll bars for the windows on the opening doors. The roof pieces for the open and closed pop up roof didn’t change. The rear seats and the table can be folded for the night. There wasn’t enough space under the windows to fold down the table. It can be folded up, instead. Doors and pop up roof closed. And then, even before I got time to post the photos, I made V3.1. I realized that the colour scheme looked better on the previous model. So I changed the plates under the side windows back from white to red. I think it really looks better this way. The mirror now is red, too. As I didn’t have the red hinge plate for the table I had to think about how to replace it. What I had was a double “open O” holder in red and a rigid 3mm tube in black. I think it looks even better than the other version. And this is how it looks with the table folded up. Credits: Please take a look at the 4-wide T1 models built by Isaac, Hot Rod, Dylan, Klingus and Ben and you’ll find one or another detail I used on this model. The new Volkswagen T1 family: Camper, Flatbed Transporter and Panel Van. I didn’t change the exterior design of the LP400, only the colour and the “underware”. Yellow was an official colour for the LP400, some of the first models were painted yellow. So I chose this colour. I’d like to build a white one, but one of the main parts, the 1×2 “cheese wedge” with grill doesn’t exist in white, yet. This one is modular, as the whole model doesn’t go through the bottleneck. So, these are the modules which had to go though the bottleneck one by one. Meanwhile I was looking for the right bottle. It had to have the right size, not too small and not too big. And it had to have a (more ore less) square cross section. And the bottleneck had to be big enough to get at least the wheels through it. The first three modules mounted together. Up to this point the building was quite easy. The rear end and rear axle mounted. On this photo you can see the biggest difficulty during the building: The “dimples” on the sides of the bottle make the interior almost round. It was almost impossible to fix the model to connect some of the modules. I thought the side panels would be difficult to mount, but these just snapped into their place, to my great delight, I have to say. The front end instead, was like a pain in the $%& to mount. Everytime I wanted to fix it, something flipped away and it didn’t connect. I tried that for more than two hours until I came up with the idea to build a special tool for it. I’ll show that one on one of the following photos. Yes, it’s done. Poooh, that was tough! A look through the bottleneck. If you think, that opening is big, here’s LEGO Nils crawling through it :-)) I still have to admit, that the bottleneck for Jeremy’s Ship-in-a-bottle was a lot smaller. So if you like this model, please take a look at his one, too. It’s just amzing. Side view: You can see that the Lambo just fits into the bottle. There’s no big gap in the length. And these are the tools I used to build this one: A pair of chopsticks, some long plates mounted as a stick and the special tool I mentioned earlier: Two joined Technic beams with a connector peg. The knob of the connector peg connected to the front end and made it possible to locate the front end exactly where it had to go. Meanwhile I used one of the chopsticks to fix the model. So this tool saved me from going mad. An update for my 4-wide tumbler with a new front, new flaps on the rear end and a camouflage version. Some changes on the front: The Tumbler now has the double front windows and the “nose” section looking a lot more like the original. I had the idea to use the large tile from Chris Rogers’ Tumbler. His Tumbler is bigger, but the look is very similar. And a little change on the rear end: The hinge plates I used for the 1×2 flaps on the previous versions didn’t exist in tan or brown, so I looked for a new way to build them. The new ones are even more flexible, they now can tilt and turn a few degrees. Side view: Mainly the changes on the front stand out. This is V1.2 of my 4-wide Lego Tumbler Batmobile. A 4-wide version of the DeLorean time machine with hover mode as seen in the “Back to the Future” movies with Michael J. Fox. Believe it or not, this one has been around on MOCpages for one month without getting noticed ;-)). Where? On this photo! This is like a mix between my 4-wide DeLorean with “normal” wheels and my 5-wide one with hover mode. I had thought about a 4-wide with hover mode for a very long time. Then I gave up and built the 5-wide instead. Ironically the solution was quite easy, just a small step away from the 5-wide. Left front view, doors closed. The interior is just the same as on the first 4-wide. You can see some more photos of it here. The “money shot”: This is how it works. I really like these ones! The Lotus seven was such a simple car: Four wheels, an engine, a cigar shaped body which just covered the chassis, two seats and a steering wheel. The result was a very light car which didn’t need a big engine to have fun, fun and more fun (when the weather was fine). 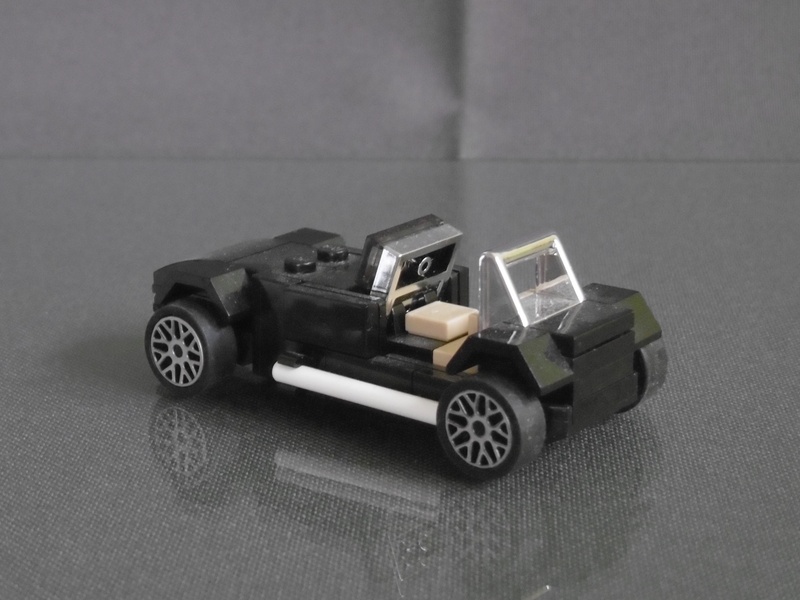 The inspiration for this model was the big Lego Ideas model of the Caterham Super Seven (21307). I wanted to build my own 4-wide version quite for a while, but I had no idea for the mudguards. 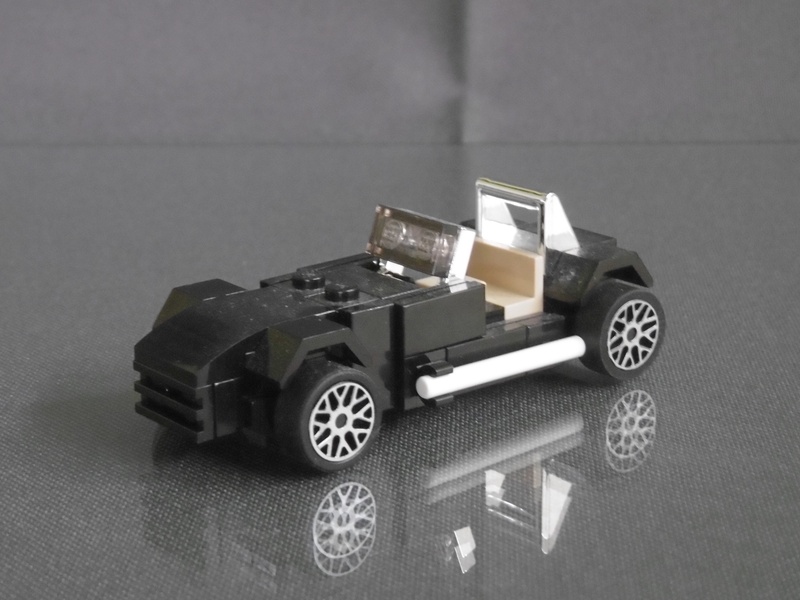 I wanted to use the smallest ones which made the original car look almost like an open wheeler. 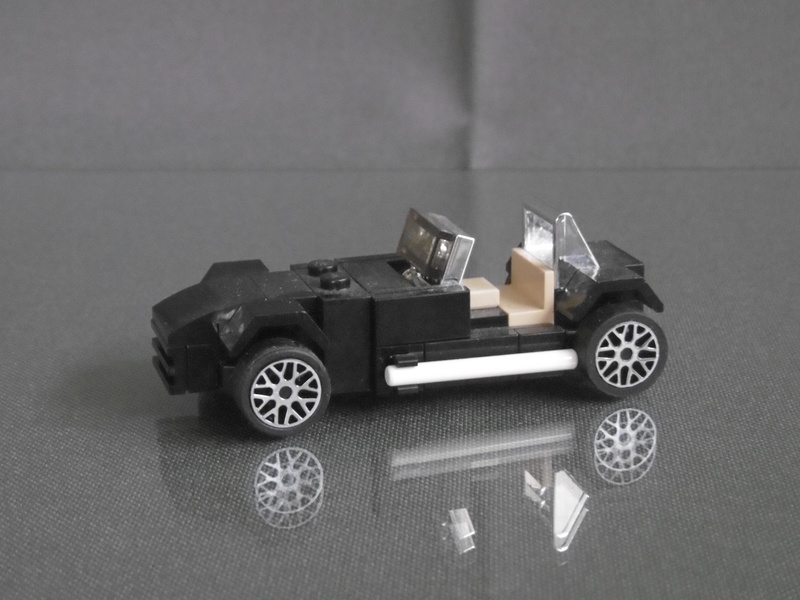 After all, the solution was simple: I had to use really old parts – the mudguards from the first 2- and 4-wide Lego cars from the late 1970s / early 1980s. I was lucky to find some in my old Lego boxes in the basement. The yellow of the Ideas model wasn’t my favourite colour at all. I’d loved to make a dark green one, but the mudguards didn’t exist in that color. So black was my favourite among the available colours. 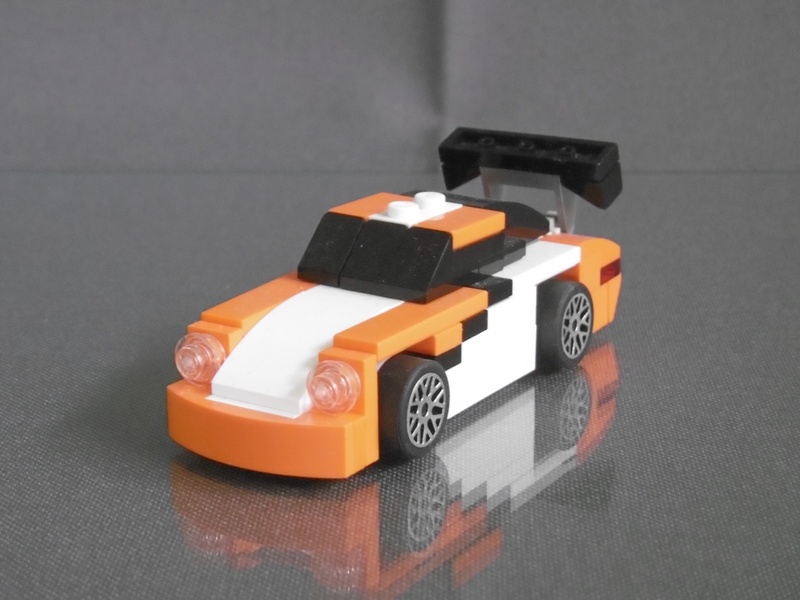 So this is it, my 4 wide Lego Lotus Super Seven. 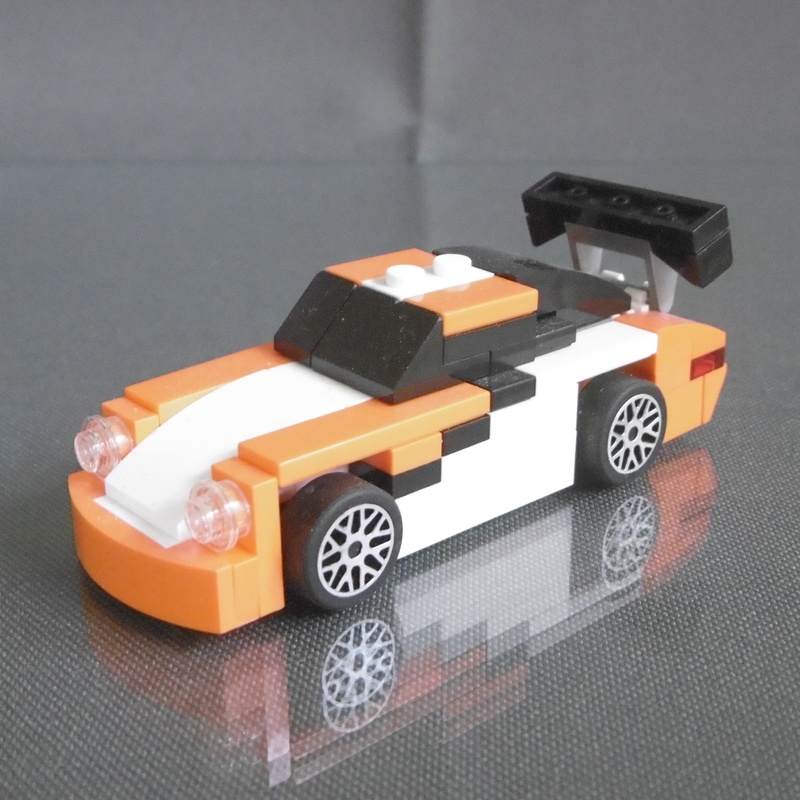 My 4-wide version of the iconic Porsche 911 GT3 (997) hybrid. It has been a while that I haven’t posted a 4-wide car. The reason wasn’t that I didn’t build them anymore. I was just busy with other projects and forgot to take decent pictures of the 4-wides I had built. When the 75912 Speed Champions set with the 911 GT3 hybrid was launched I knew I had to build my 4-wide version of it, too. Then Malte Dorowski posted his pictures of his two versions in different scales (next to the SC model) and they gave me the final kick to start building. Rear view: The new rear end with the big wing and the diffusor. 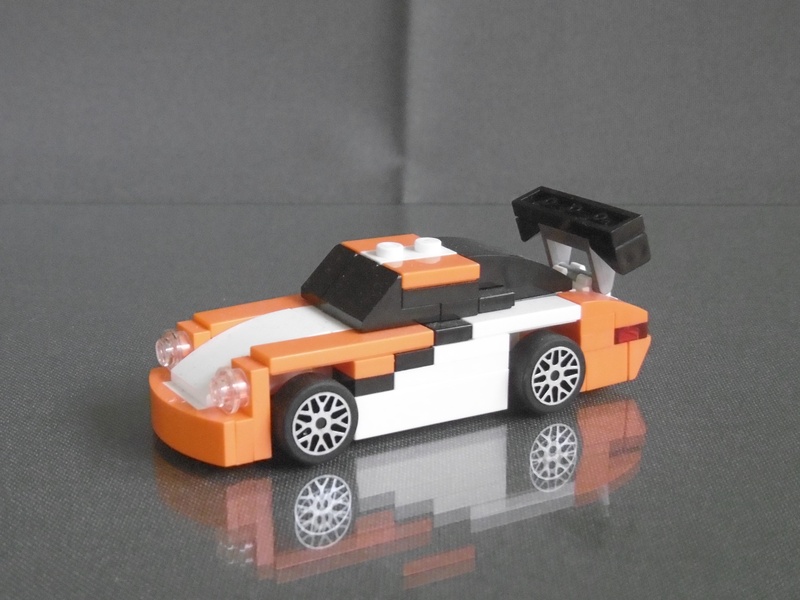 So this is my 4-wide Lego Porsche 911 (997) GT3 hybrid. Most of my models built with brix are 4-wide car models.